Come See Me Present My Maps! 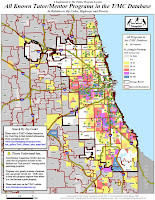 I will be presenting and discussing my maps THIS FRIDAY at the 2009 Spring Tutor/Mentor Conference at the Northwestern University School Of Law, downtown Chicago. I will be presenting with Dan Bassill, president of Tutor/Mentor Connection, and community leader/organizer for over 30 years. Using Maps to Create Collaborative Strategies. 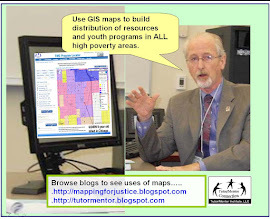 Bassill and Trakan will overview collaboration strategies and uses of maps to draw volunteers and donors to different neighborhoods of a city, and to all tutor/mentor programs in each neighborhood. The speaker will also show how Google Maps can be used to locate potential business, church and civic partners in the same neighborhood of tutor/mentor programs. who were part of the November 2008 conference. There will be workshops on non-profit planning, evaluation, recruitment and training, marketing and development. The focus will be on tutoring and mentoring of course, so if you are at all interested in learning more about these programs please join us. But there are networking and learning opportunities for anyone interested in community/social work... oh and did I mention the MAPS?! If you have not registered, please do so today! Commuters were greeted first thing this past Monday morning with some grim news. Reporter Tracy Swartz has been keeping tabs on all murders that have occurred in Chicago through the first 5 months of 2009. This week her work made the front page of the Chicago Tribune affiliated (and widely-distributed) free commuter paper, The Red Eye. 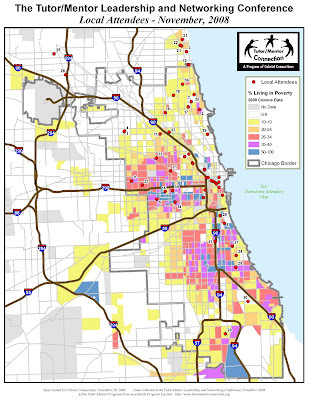 The online version of the story links to a Google Map that plots each of the 100+ murder locations, and then breaks down the stats, showing us that "most of the ... murders … were concentrated in South and West Side neighborhoods." … "Most of the victims were black, male and between the ages of 20 and 25 years old." She interviews a representative from the police and reveals the neighborhoods with the highest murder rates – notorious names: Greater Grand Crossing, Englewood and East Garfield Park . She explores ties to gang violence and guns. She paints us a picture of "the typical murder victim … black, male, between 17 and 25 years old [with] a prior arrest history." I suspect these numbers and images are easy for most commuters to digest. After all, I assume most purple line riders already avoid these neighborhoods, either having no reason to venture into them, and/or fearing the alleged "warzone" activity that is routinely brought to our attention by local media. I was reminded as I was reading, of an article I wrote a few months back in reaction to a different Chicago Tribune story. I wrote of how the media seems to have a lot of success with "counters." It sort of reminds me of watching ESPN sometimes. As though people can't wait to check in to see what the score is up to: "What is the number of dead CPS students today?" "How many murders has there been in the first quarter of the year?" The media seems to have either created, or at least taken advantage of a culture that sort of dehumanizes the people who are living in these scary neighborhoods. Sadly, there is rarely as much effort from the media to introduce us to the people and groups who are working with the tens of thousands of students who aren’t among the 100 dead. There is little coverage of how many volunteers go into those neighborhoods and come out alive after working with programs that are working for solutions. I've been wondering a lot lately: Why is revealing a dead count "investigative journalism," but encouraging readers to work for solutions "editorializing"? It seems sometimes that that's the way media looks at its role in handling social issues. With this said, I applaud Swartz for going a step further and introducing us to community leaders that say "more emphasis should be placed on giving children alternatives to violence." She focuses our attention in particular to the fantastic work Phillip Jackson does with his Black Star Project, "which reaches out to black youths with education and job training programs." She quotes Mr. Jackson as saying that "the black community needs to educate youth and provide them with mentors so they don't look up to gang members or drug dealers." I agree of course, and like what Swartz is doing here, but still think this report falls a little short in one important area. How can a concerned commuter get involved with a program like the Black Star Project? They can look them up on the web, fine. But what about the hundreds of other programs that are working in other neighborhoods with other demographics? Wouldn't it be helpful to hear about them too. Because of course, this is not an issue that affects only the black community (although you might get that sense when reading articles like this one that throw the word "black" at you over and over again). And Black Star is only one of 200+ known programs that offer tutoring/mentoring services to kids who are more interested in passing college entrance tests than pulling triggers. In fact, if you look at my supplemental map at the top of this article, you might conclude that "poverty" might be a stronger predictor of violence than neighborhood of residence (or certainly race). 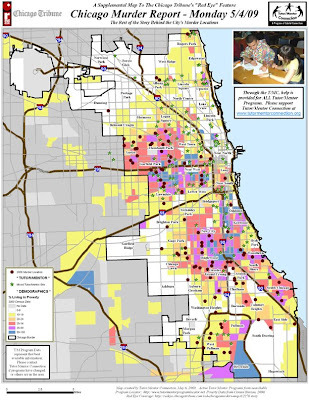 And if you look at my maps of the whole city, instead of the regularly featured neighborhoods (places by the way where law-abiding and business-deprived residents really don’t need the media to keep piling on the negativity), you’ll see that there ARE "alternatives to violence" that exist already – tutor/mentor programs. You also might draw the conclusion that there needs to be a lot more programs (each one can handle only a few dozen kids and many need more funding and volunteer interest). I hope the media looks at these strategic documents at The "Tutor/Mentor Institute" as well, and decides to do more than just report the negative news. I hope they find a way (within the bounds of however they define "journalistic integrity") to point concerned readers/viewers/listeners to the Tutor/Mentor Connections' database, and its online searchable Program Locator, so citizens can find a place to help kids of all races and ages everywhere find alternatives to the streets. I plead with the media to use its leverage to direct donors and benefactors to non profits like Tutor/Mentor Connection so that they have the money to survive and continue working to end poverty and violence. And of course my big idealistic dream is that one day, the media decides to use its immense power of persuasion to start wowing and shocking commuters with stories of hope and solution. In America where the media is almost entirely commercialized, its role, whether they admit it or not, has become one of "taste-maker." Please make it fashionable for your customers to want to read about how problems are not only found, but actively addressed by programs like tutoring and mentoring. Society is relying on you for information. Right now it seems sometimes you're only doing half the job.